The Achilles tendon is the strongest tendon in the human body . Hippocrates said “this tendon, if bruised or cut, causes the most acute fevers, induces choking, deranges the mind and at length brings death” . Achilles tendon rupture has been the focus of many studies since Ambroise Paré initially described it in 1575 . 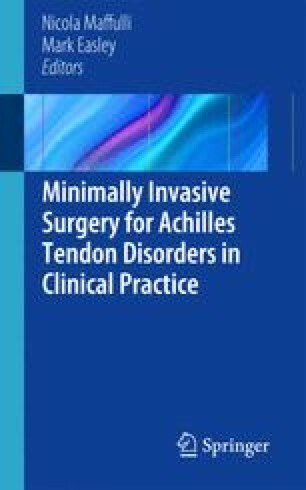 Achilles tendon ruptures are the third most frequent major tendon ruptures, following rotator cuff and quadriceps ruptures [4, 5]. Nevertheless, there is no consensus on the optimal management, and management is still determined by the preferences of the surgeon and the patient. Cast immobilization may lead to suboptimal healing, with elongation of the tendon, reduced strength of the calf muscles, and an unacceptably high rate of re-rupture [6–10]. We would like to thank to Professor Nicola Maffulli for his support and Dr. M. Ayvaz and Dr. G. Dönmez for archiving and pictures.